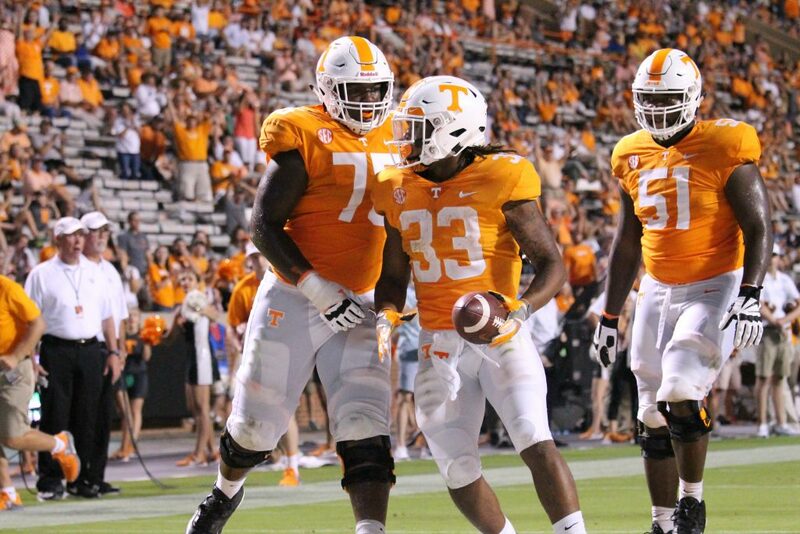 It appears as if Tennessee freshman Jeremy Banks’ switch to defense was very short-lived. That or head coach Jeremy Pruitt is simply wanting to get him work on both sides of the ball as the Vols head into the homestretch of the 2018 season. According to Jesse Simonton of Volquest, Banks was back with Tennessee’s running backs at practice on Tuesday. This time last week, Banks was moved over to defense to practice with the Vols’ linebackers leading up to the South Carolina game. Now, however, the freshman was back with UT’s running backs during the open portion of practice. After all the hullabaloo about switching to linebacker — both by Jeremy Pruitt and even among multiple teammates Tuesday — Tennessee freshman Jeremy Banks was back at running back today. It’s unclear if this is a permanent move for Banks or simply just a matter of getting him work on both sides of the ball. Keep in mind that the media doesn’t get to see all of practice, so Banks could’ve easily gone back to working with the linebackers once the media left the field. But it’s still interesting to note that Banks is already back practicing with the running backs just a week after he switched over to linebacker. Head coach Jeremy Pruitt mentioned there was a possibility of moving Banks back to running back down the line, and he also said that having Banks at linebacker wasn’t exactly an experiment. He stated that Banks himself asked for the move to defense. After moving Banks to linebacker, Pruitt elected to move junior Carlin Fils-aime back to offense. Fils-aime had been a running back for Tennessee during his first two years on campus, but Pruitt moved him to defensive back this year. But with Banks being switched over to defense, Pruitt said he wanted a fourth back still on the roster and decided to move Fils-aime back to offense. Though limited, Fils-aime impressed on Saturday in his debut this season. He carried the ball three times for 20 yards and scored on a 14-yard run against South Carolina. That touchdown was the fifth of his UT career and marked the first score he tallied since he scored twice against Indiana State last season. It was also the first time he carried the ball since he totaled two attempts for 31 yards against Vanderbilt in Tennessee’s season finale last year. Pruitt will speak to the media after practice on Wednesday, and he will address the move then. As a freshman, Banks has 41 carries for 161 yards and three touchdowns while also adding a catch for 10 yards. He’s fumbled the ball three times and has lost two to opponents. The freshman also has a special teams tackle this year. Sign up for the RTI Mailer to receive email updates! Marquez Callaway: South Carolina Game "A Good Lesson for Us"
Nathanael Rutherford is the managing editor and social media manager for Rocky Top Insider. Nathanael graduated from the University of Tennessee and cultivated a passion for the Vols while growing up in Knoxville a mere 10 minutes from Neyland Stadium. He's been a part of the RTI team since November of 2015 and has been the editor of RTI since June of 2017. If he's not talking or writing about Tennessee athletics, he's probably talking about Star Wars.